What follows is from: SBC. June 2013. Concentrating Solar Power. SBC Energy Institute. The best sites are between 10° and 40°, South or North. As you can see in the chart below, this makes a huge difference, a CSP in Chile might cost half as much as one in Spain. 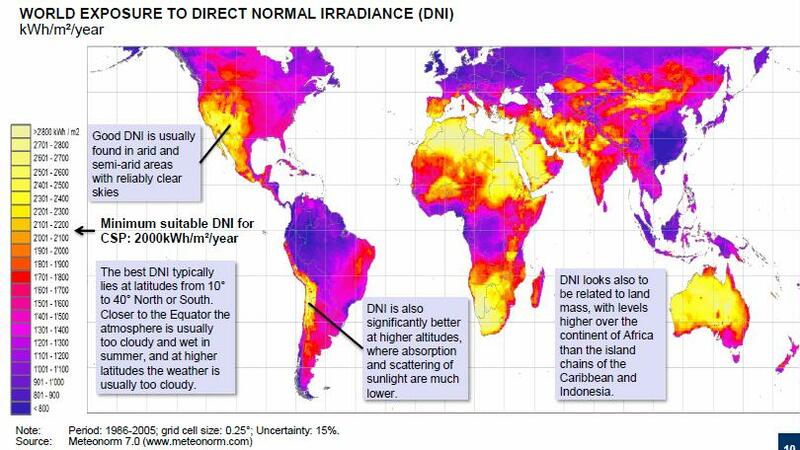 Locating a plant with a solar irradiance of 2,700 kWh/m2 would decrease the generation cost by 25% compared with the same plant with 2,100 kWh/m2. Minimum suitable DNI for CSP is 2000 kWh/m²/year. The problem with less than 10° north or south is that the atmosphere is usually too cloudy and wet in summer, and above 40° the weather is too cloudy. DNI is also significantly better at higher altitudes, where absorption and scattering of sunlight are much lower. DNI looks also to be related to land mass, with levels higher over the continent of Africa than the island chains of the Caribbean and Indonesia. CSP installed capacity was just 2.8 GW at the end of 2012. Investment in CSP very limited, with 18 USD billion invested in 2011 compared with 125 USD billion for solar PV and 84 USD billion for Wind. pain and the US dominate the market, with 69% and 28% of installed capacity respectively. The US should continue to drive the market, with 3.4 GW of capacity additions by 2017. CSP’s land requirement averages 50 MW per km², midway between solar PV and Wind. As you can see, the best places are deserts where there’s little water. Like any thermal power plant, CSP needs water for cooling processes, which may have a significant environmental impact in arid and semi-arid areas. Water consumption refers to water that disappears or is diverted from its source, for example by evaporation, incorporation into crops or industrial processes, drinking water…It is smaller than water withdrawal, which refers to water that is essentially “sucked up” for a given use, but then returned to its source. Unless dry cooling technology is used, CSP requires a significant volume of water for cooling and condensing processes. But dry cooling is more costly, with efficiency reduced by up to 7% because more energy is required to power the fans and because higher re-cooling temperatures result in higher condensing pressures and temperatures. As a consequence, 2-10% more investment is required to achieve the same annual energy output as a water-cooled system. CSP 8-10% of global electricity? In the long run, the International Energy Agency (IEA) estimates that CSP would need to meet 8%-10% of global electricity demand by 2050 to limit the average global temperature increase to 2°C, requiring an installed capacity of 800 GW. By comparison, 2,000 GW of solar PV capacity is required to supply the same amount of electricity. The higher load factor for CSP explains this difference. For CSP to meet 8% of electricity demand, significant deployment outside the OECD and China would be required. That will require long-distance HVDC transmission lines and add significantly to costs. The IEA believes the LCOE of CSP would need to fall by more than 75% for their plan to succeed mainly via economies of scale, decrease in component costs and higher efficiency. Opponents such as Hermann Scheer argue that the project is unrealistic and potentially harmful. Most critics cite the monumental initial cost and the energy penalty of long-distance power transmission, but also security of supply concerns for Europe, arising from the MENA region’s political stability. (The Desertec Industrial Initiative is a private-sector consortium proposed in 2009 by the Club of Rome with the support of the German Aerospace Center (DLR), which promotes large-scale renewable energy projects involving the European Union and Middle East and North Africa. DII is composed of powerful stakeholders and is dominated by companies such as German RWE, Munich Re or Deutsche Bank, but also Spanish Abengoa Solar, Swiss ABB or Algeria agro-food Cevital). Concentrators & receivers: 1) Seek an alternative to conventional rear-silvered glass mirrors (e.g. polymer-based films); 2) Develop a tracking system to track the sun and ensure that reflection is optimized; 3) Improve the solar field set-up. Heat Fluid Transfer & Storage: 1) Seek new heat transfer fluids and storage media (e.g. phase change material, molten salts); 2) Develop Phase Change thermal storage for all direct steam generation solar plants. Central receivers: 1) Develop air receivers with Rankine or Brayton cycle; 2) Develop solar tower with ultra/supercritical steam cycle; 3) Develop multi-tower set up. Develop ground and satellite modeling of solar resources: 1) Improve satellite algorithms to obtain higher spatial resolutions to map high DNI areas better; 2) Develop sensor systems, computing systems and software to optimize sun-tracking systems, adapt to the environment (such as high wind conditions), and to control engine use. 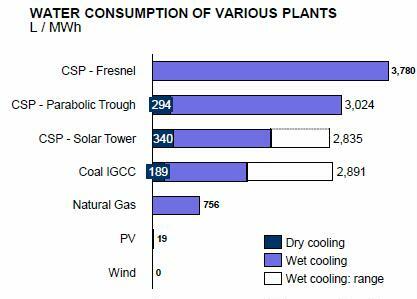 Not fossil free: Almost all existing CSP plants use a back-up fuel (usually natural gas) to substitute or complement thermal storage. CSP is a capital-intensive technology. Initial investment, dominated by solar field equipment and labor, ranges from $2,500 to $10,200 USD per kW mainly depending on capacity factor and storage size – and accounts on average for 84% of the electricity generation costs of CSP. The remaining 16% consist mainly of fixed Operation and Maintenance (O&M) costs. Fixed O&M averages around 70 USD per kW per year, while variable maintenance is limited to around 3 USD per MWh. Although fuel costs are low, Operation & Maintenance (O&M) costs at CSP plants are still significant, at around 30 USD/MWh, the main components are replacing mirrors & receivers due to glass breakage, cleaning the mirrors and insuring the plant. Depending on the boundary conditions, in particular solar irradiation resource, the levelized cost of electricity (LCOE) from CSP ranges from $140 to $360 USD per MWh. The Desertec Industrial Initiative is promoting the installation of CSP plants in the sun-rich MENA deserts, with the aim of CSP’s contribution to European electricity supply reaching up to 16% by 2050. However, this 400 USD billion energy plan has sometimes been criticized on its economics and local fall-throughs. Parabolic Trough 6 to 8h storage: $ 7,100 – 9,800 USD/kW Capital cost, 40% to 53% capacity factor. Solar Tower 6 to 7.5h storage: $ 6,300 – 7,500 USD/kW Capital cost, 40% to 45% capacity factor. Solar Tower 12 to 15h storage: $ 9,000 – 10,500 USD/kW Capital cost, 65% to 80% capacity factor. This entry was posted in Concentrated Solar Power and tagged concentrated solar power, CSP, DNI, irradience, solar thermal. Bookmark the permalink.